Yes, that’s a candy casket. Well, the casket itself isn’t candy, it’s plastic. But I’m betting you all remember the first time you saw one of these back in the day, right? Me? Here’s what I remember. I’m with my mom at the store, picking up something unimportant. You know, like a loaf of bread or milk or carton of orange juice. And at the checkout counter is this cardboard display of multi-colored tiny plastic caskets. Can you say: eyes as big as saucers? I wanted one. Well, I wasn’t selfish, but I wanted them all. Or at least, one of each. Orange, yellow, red and of course, the best of the lot—a solid black one. Mom, however, was unimpressed. In fact, when I made the inquiry, I believe her response was, “No! That’s disgusting!” And so, disappointed (more so than the guy behind the counter who’d just lost out on an additional fifty cent sale), I went home, grim-faced and gloomy. Shortly thereafter, the candy caskets disappeared. I thought they were gone forever, like a movie you’d missed in the theatre that didn’t later air on NBC, ABC or CBS. Yep, those days—before either cable or VHS. 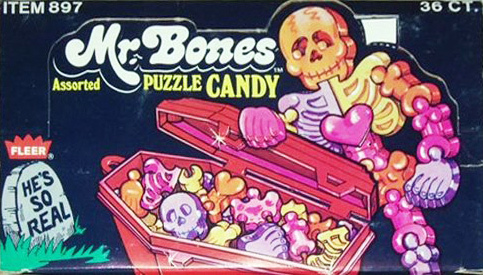 A pop-up display box for Mr. Bones. Eventually, I got over it. Time passed. And then, the following Fall, everything changed. For upon my return from gallivanting around in my Spider-Man costume, I emptied my plastic jack-o-lantern to discover…my very own candy casket. No, it wasn’t the black one, but it was almost as good. The blood-red one! I recall opening the little hinges and looking inside and finding—no, it couldn’t possibly be this cool, could it? But of course, it was. Candy bones! A disarticulated candy skeleton! Even a skull! Can you imagine the joy of an eight or nine year old kid who thought he’d never again see something so awesome actually receiving the manna of candy bones to gnaw on? Surprisingly, Mom didn’t much care about my newfound treasure. And to be fair, a year had passed. She’d probably seen hundreds of these things in the supermarket while buying our own bags of candy to hand out. And so, I was allowed to keep this now only-slightly ghastly goodie. Fast forward a little. The original candy casket is gone. Probably ruined after being left on a radiator cover during a reenactment of torch-bearing villagers assaulting Castle DracuStein, because, didn’t the castle’s in both movies look pretty much the same? Anyway, Mom and I are in a toy store, and not only do they have a whole display filled with candy caskets—including the desperately-sought-after black one—but a real, honest-to-goodness working Fester’s light bulb. Did I happen to mention that I was a huge Addams Family fan? Guess it went without saying. So, here I am, looking at this technological breakthrough—a light bulb that, according to the box, would light up when you put it in your mouth! Well, ten year old me was certain we couldn’t live without this scientific marvel, and though I left that store disappointed, too, I did manage to score a black candy casket to replace the liquefied red one from the Halloween before. 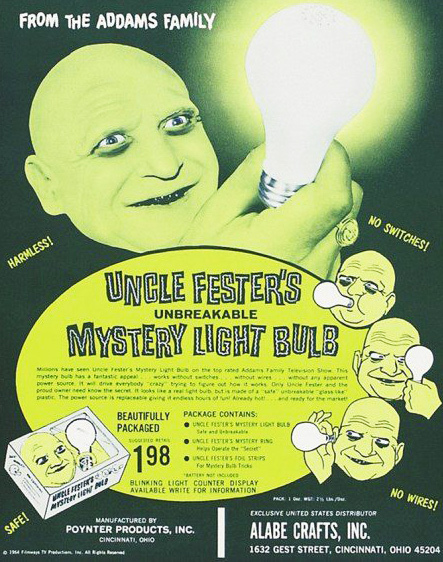 The working Uncle Fester light bulb was eventually removed from the market because it was declared a fire hazard. (No, I never read about anyone bursting into flames while using it, but back then, you really didn’t question your Mom on such things. She knew best). Recently, some of the original devices have found their way onto eBay and other auction sites, and I’m told there’s a new version which doesn’t threaten to turn you into a cinder should you want to shave your head, put on a black cloak, and happen to find yourself short on illumination. Unfortunately, I haven’t walked through a store with my wife and come across one yet. How about you? Got some childhood memories about the toys you coveted most? The toys your parents put the kaibosh on? What was the biggest treasure you missed out on as a kid, but came across later and made up for? Let’s hear from the underprivileged!